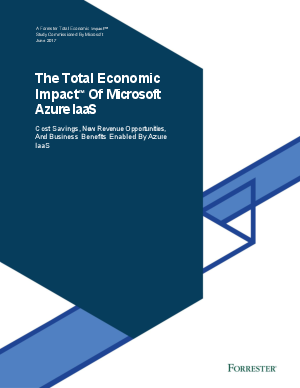 The 2017 study, The Total Economic Impact™ of Microsoft Azure IaaS, gives insight into both the costs and benefits of large-scale Azure infrastructure as a service (IaaS) implementation. This commissioned study conducted by Forrester Consulting analyzes the return on investment and business impact that several enterprises experienced when moving from a primarily on-premises environment to Azure. The companies interviewed come from a variety of industries and locations (global/multinational, North American, and European). Reduced data center and outsourcing costs. Website scale and performance improvements. Ease of experimentation through virtualized environments. Download the study to learn about the potential ROI that could be realized by shifting some or all of your management and operations to Azure.